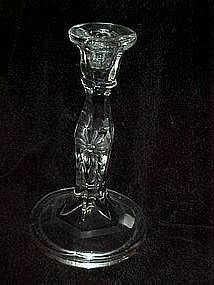 Single tall candle holder, we believe is hiesey glass though there is no mark. Measures 8" tall and has a lovely thick flower cutting on the stick area and a six sided band cutting at the base. No chips or cracks. There are a few bubbles. This is a very nice quality candle stick.